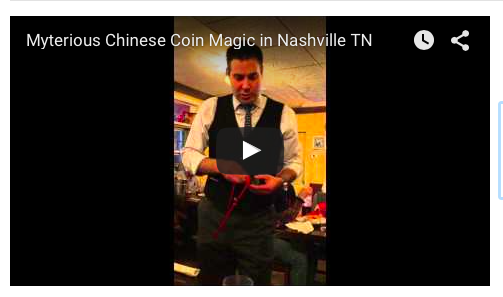 This week for the video blog I perform an amazing close-up magic trick at Coco’s Italian Market where three Chinese coins that are stranded on a red ribbon each melt off the ribbon one at a time. There is lots of audience participation in this trick. As David Blaine said, you have to see magic live and in person, the same is true of this trick. The good news is you can hear the audience reaction but the lighting is a little dark so at points it is difficult to see the Chinese coins. As summer winds down and we move into fall, I am receiving more and more requests to perform. Requests for having me at the magician at parties are coming in from Elkmont AL, Brentwood TN, Nashville TN, Chattanooga TN, Lebanon TN, Clarksville TN and many other places in our region. Maybe one reason there are so many requests for magic is because there are a number of shows on television featuring magic. Many people in the restaurants have been mentioning America’s Got Talent, The Carbonaro Effect, and Penn and Teller Fool Us. Have you seen any of these shows and if so which one is your favorite?